Klip Dagga, also known as Lion's Ear, Shandilay (Trinidad), Christmas Candlestick (America) and Grantiparani (India), is originally from Africa and southern India. It has become naturalized in subtropical and tropical areas all over the world and is often found along roadsides and in abandoned fields where it can grow up to 3m tall. Klip Dagga is an erect, loosely branched annual with strongly angled stems (square in the cross section) and the leaves are smooth, triangular in shape and in pairs opposite each other. Flowers are borne in rounded, spiny clusters that encircle the stems so that it looks like the stems are growing right through the middle of the clusters. As the stems elongate, new flower clusters continue to develop above the older ones. 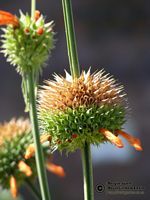 The tubular flowers that peek out of the spiny heads are orange and furry, like a lion's ear - they are about 2.5 cm long and curve downward. Klip Dagga is drought tolerant once established and they need full sun or light shade. There can be confusion between Klip Dagga Leonotis nepetifolia and Wild Dagga (Leonotis leonurus) as they look similar and are called the same common names: Lion's Ear and Wild Dagga. The difference between the two plants is that Klip Dagga has leaves like Catnip (Nepeta cataria) and Wild Dagga has leathery leaves. For both species, leaf shape varies depending where it is on the stem; higher up, it is narrow and long. The flowers of both plants are popular with sugarbirds. The leaves and flower petals. Klip Dagga has long been used in African traditional medicine as a treatment for fevers, headaches, malaria, dysentery and snakebite. It has an effect on the uterus - depending on the dose it will stimulate- or suppress menstruation. In Trinidad it is a common cold, fever and asthma remedy. Studies suggest that teas or tinctures made with the leaf possesses anti-nociceptive properties (it inhibits the sensation of pain), is anti-inflammatory and hypoglycemic and therefore lend pharmacological credence to the folkloric uses of this herb in the management and/or control of painful, arthritic, and other inflammatory conditions, as well as for adult-onset type-2 diabetes mellitus. Both Klip Dagga Leonotis nepetifolia and Wild Dagga Leonotis leonurus are excellent heart tonics. They are used for heart conditions associated with anxiety and tension and will calm palpitations, tachycardia and irregular heartbeats. The dried foliage of Leonotis - both Wild Dagga and Klip Dagga - can be used as a legal substitute for marijuana (ganja, cannabis, hemp). Smoking this dried herb gives an euphoric-like effect and exuberance. The flowers are the most potent part and can be smoked or used as a calming tea.